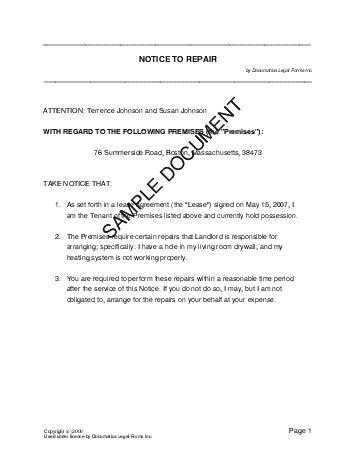 A Notice to Repair is sent by the Tenant(s) of a Premises to the Landlord to notify the Landlord that the Premises is in need of some repairs which are the Landlord's responsibility, and outline the time period within which those repairs should be completed. Does the repair affect the health or safety of the Tenant(s)? We strongly recommend obtaining an attorney reviewed Notice to Repair directly from us. Below are some random samples we have created with Documatica. Please note that these documents reflect a certain set of answers, and it is very likely that the document you require is different. 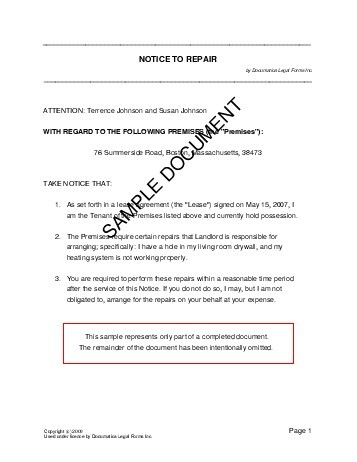 Do not rely on the templates below - create your own customized Notice to Repair with our webpage. For maximum legal protection, obtain a lawyer reviewed Notice to Repair directly from us.